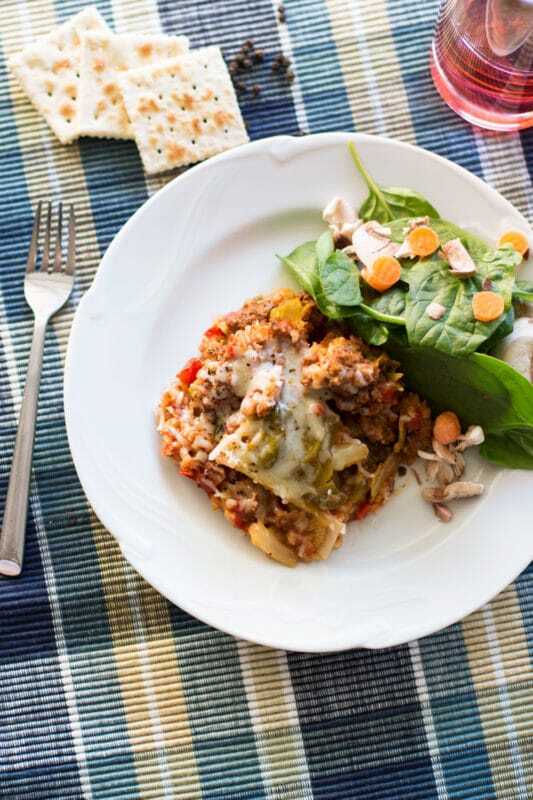 This hearty and savory Crock Pot Cabbage Roll Casserole is cooked in a rich tomato sauce, full cabbage, beef and herbs! 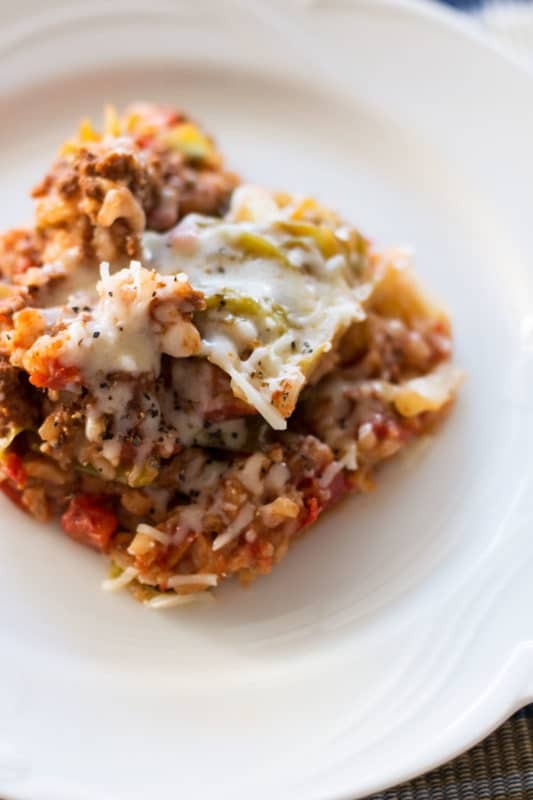 Super easy to make, this Crock Pot Cabbage Roll Casserole makes for a perfect weeknight meal! 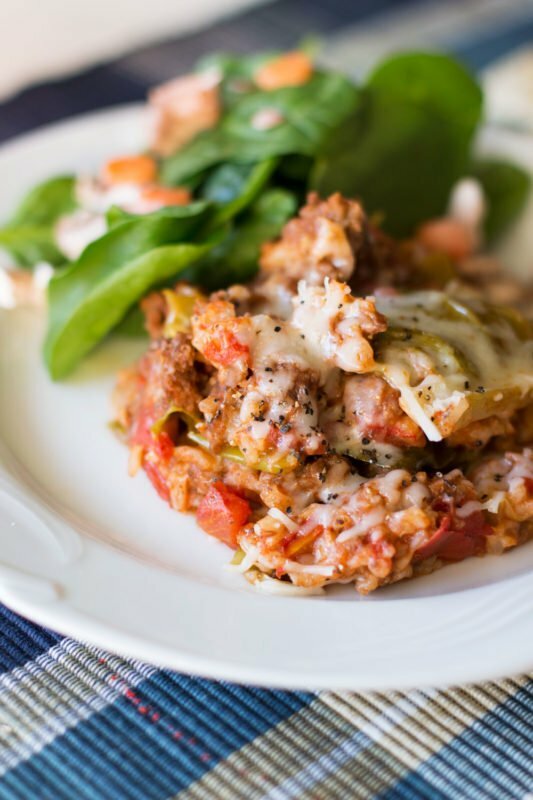 Cabbage Roll Casserole = seasoned ground beef, tomato sauce, rice and cabbage topped with melted mozzarella cheese…oh my love!! This is the most delicious and comforting simple food of my sweet dreams! I’m southern. I love a good casserole. 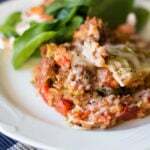 And this casserole is healthy and gluten free! 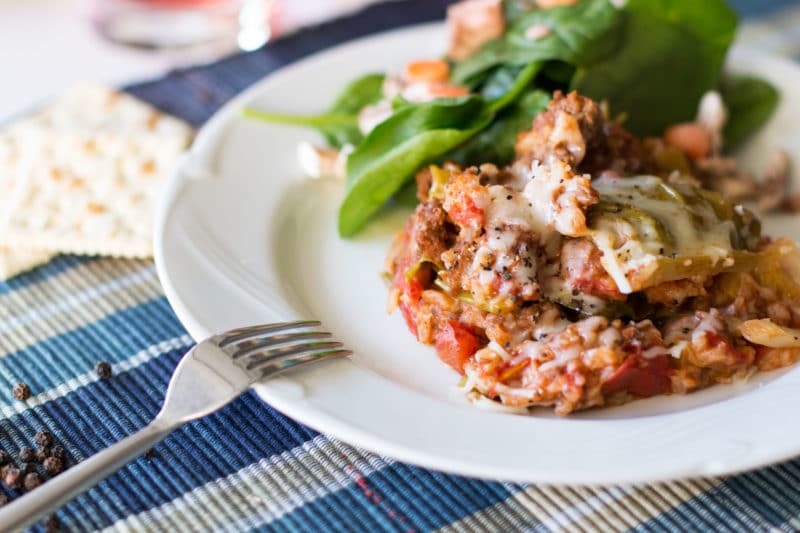 You just don’t typically hear those 4 words together…healthy, casserole, southern, gluten free. But this casserole is just all of THAT, ya’ll!!!! And it’s made in my Crock Pot! Winning! WINNING big time here!! Oh, that melted mozzarella cheese on this Cabbage Casserole! Is your mouth watering yet? My friend, Vicky Crowley brought this dish to work for several us to try as a part of a lunch coop. FANTASTIC is all that needs to be said on this one! I had seconds…FOR LUNCH. I never do that. It makes me too sleepy to eat that much at lunch! Yep…it’s THAT good! I grew up eating casseroles. They are a part of me…embedded in me. Like this casserole my mom used to make…she called it Brenda Rowland’s Chicken and Rice Casserole. Because….well, that’s what it was! It’s was Branda Rowland’s casserole recipe! We call it what it is in the south! We keep it straight and to the point! But back to this Cabbage Casserole…ok, so I have littles. 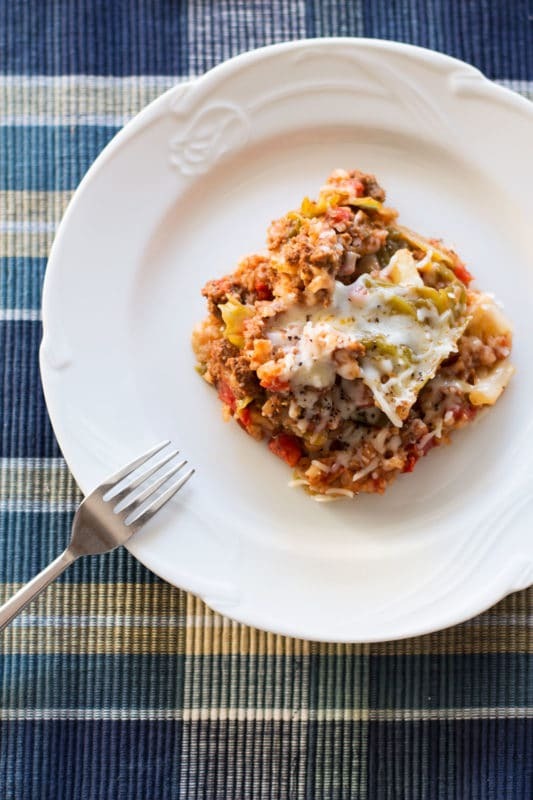 I need easy in my life sometimes and that’s what this Crock Pot Cabbage Casserole is…easy! And those littles LOVED this casserole! And it has cabbage in it! My littles ate cabbage and loved it! Again…SO winning again with this casserole! Thank you so much Crock Pot for making my life easy! I just can’t say that enough. Again I have littles and that’s why I just have the thank the makers of the Crock Pot and Instant Pot. Ok…moving on now. Back to this amazing Cabbage Roll Casserole. I love the name…it just rolls off my tongue!! If you’re gluten free, make sure you use a gluten free version of tomato soup. Definitely make sure to read your labels because not all tomato soups are gluten free! As a matter of fact, read the labels on the tomato sauce and diced tomatoes to ensure all brands you use are gluten free. Serve this dish with a side salad, like my Romaine Salad. Go get’em casserole lovers! Ya’ll are gonna just LOVE this one! Brown beef, onion, garlic and seasonings over medium heat until no pink remains. Drain. Chop cabbage into 4 wedges and remove core. Chop into chunks (Vicky’s were about ¾”x1.5″). 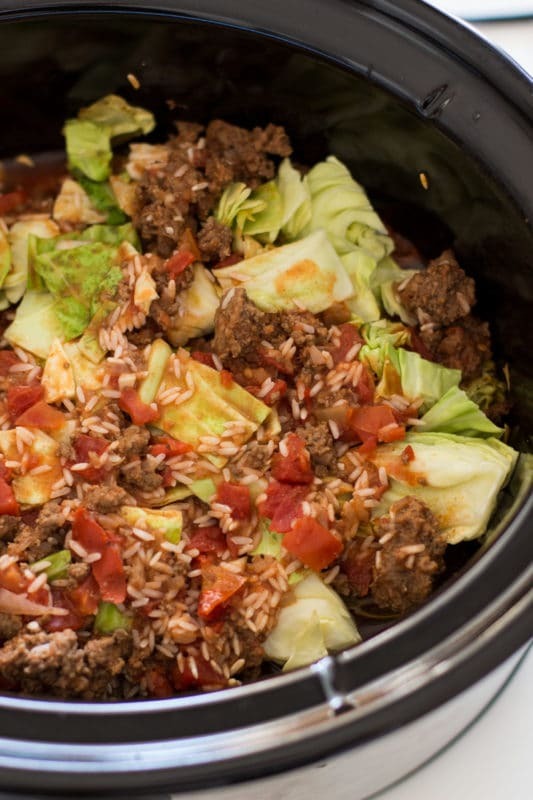 Layer ½ of the meat mixture and ½ of the cabbage in the slow cooker. Repeat layers. Place half the meat and then half the cabbage in cooker. Cook on low 4-6 hours or just until rice is cooked. Once done, turn Crock Pot off, sprinkle mozzarella cheese on top and let sit 10 minutes to set and melt cheese. Add salt and pepper to taste. FYI ya’ll…this is Vicky’s original picture she took at our lunch coop!! I had to keep the original! Loving this recipe?! Don’t forget to pin this one to your favorite CASSEROLE, CROCK POT and DINNER board on PINTEREST!! Love that it’s made in a crock pot, aka my BFF. Love that the ingredient list is simple. Love how yummy it looks. Love, love, love this recipe! So funny…my slow cooker is my BFF, too! My Instant Pot is my 2nd BFF!! I had to smile reading about how you grew up with casseroles, because this recipe reminds me a lot of something my own Mom used to make! Unfortunately for her I’m pretty sure I turned up my nose at it at the time, but of course now it sounds really tasty to me! I can’t wait to try it and tell her – she’ll laugh and be glad I’ve evolved, I am sure! HA HA!! yes – she sure will be proud! I hope you enjoy this one! What’s funny is that I HATED casseroles when I was younger, but now that I’ve grown older (and hopefully wiser) I can’t get enough. This looks like the perfect late winter easy recipe! Yes! It’s a great winter recipe! Enjoy!! Mmm…love me some cabbage rolls! I’ll definitely be adding this to my list of low carb dinner recipes. Thoughts on using riced cauliflower instead of traditional rice? What modifications should I make before I attempt making this? I don’t recommend using cauliflower rice in this recipe. It will fall apart and become all mushy. Hi Kevin! I’m SO glad you liked it…and your kitty, too!! Thanks so much for writing in and leaving a comment! do you think I could use brown rice in place of the white? Absolutely!! Brown rice would be great to use in this recipe!! Thanks for posting this great-looking recipe. I use my slow-cooker almost exclusively. I was wondering if it would be okay to add pre-shredded cabbage (ie, for Cole slaw) instead of chopping the cabbage as you’ve directed? Absolutely!! Cut corners where you can to save time! Using a bag of pre-shredded cabbage (like coleslaw) should totally work! I would look for bigger chunks in your pre-cut bag. Let me know how it turns out!